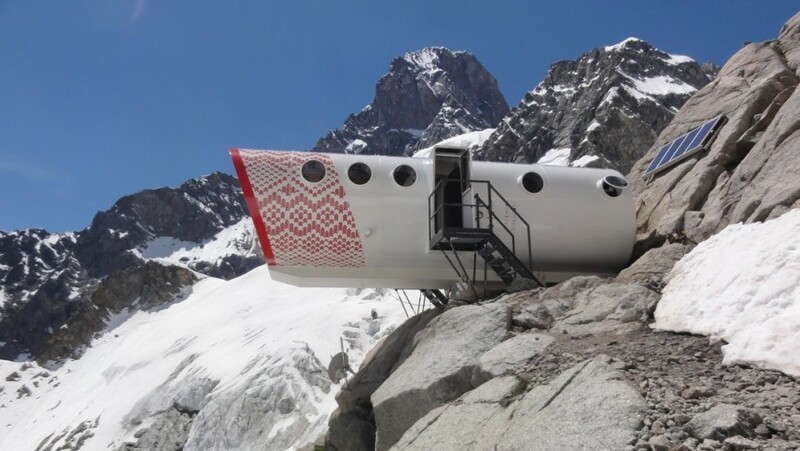 Spectacular, unusual, stunning, but always environmentally sustainable: we made a trip through the mountains of the world to discover the most beautiful eco-friendly shelters. Today we want to tell you about innovative buildings, designed by architectural firms to integrate seamlessly with the surrounding environment, even using unusual and spectacular forms, using natural materials and advanced technology to not pollute and be self-sufficient from an energy point of view. Here are 5 eco-friendly shelters that we fell in love with! 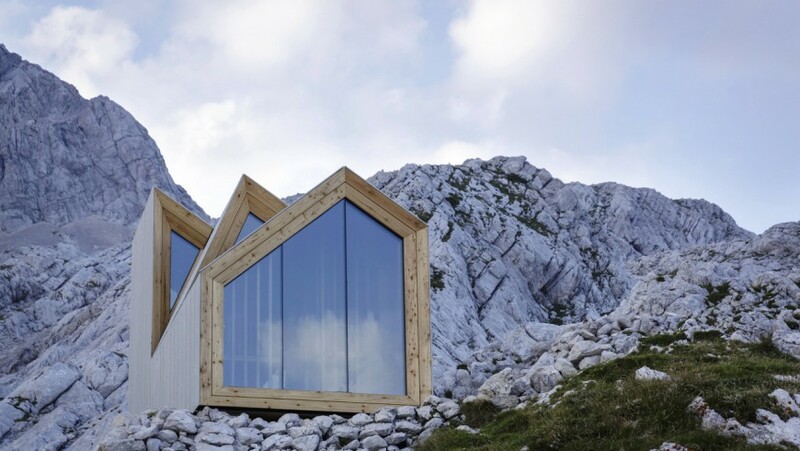 We are on Skuta, Slovenia, and here, among breathtaking landscapes, a modern shelter hides. It’s a modular and prefabricated building, designed by Harvard students with the Ofis Architects studies. It is a small architectural gem that integrates seamlessly with the peaks around. 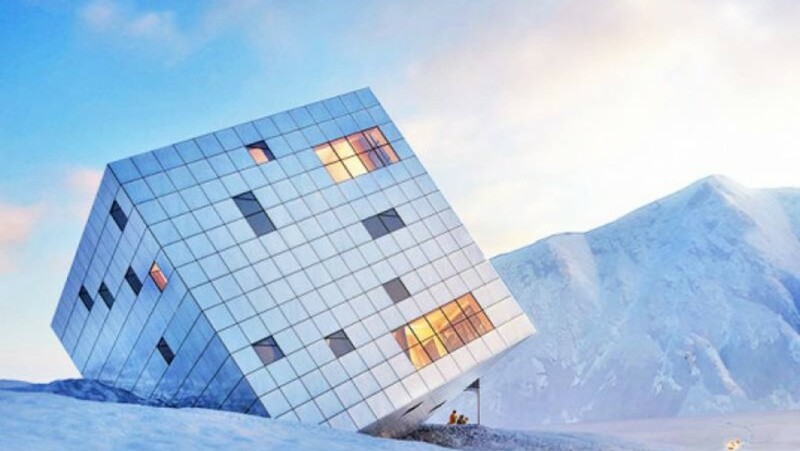 The materials used and the external form have also been chosen to counter the extreme conditions of this place. Arriving here at 2532 meters high, you will find a space dedicated to the kitchen, a place to sleep with a few bunk beds and another with some bunks. We move to France and climb up to reach 3835 meters above sea level. Along the French normal route, in the Mont Blanc massif, there’s the Refuge of Goûter, a historic shelter, built in 1906. It is the highest guarded refuge in the country and has recently been restructured following the principles of bio architecture and using the latest technologies. After 4 hours of walking we reach the new structure made of wood and metal, partly suspended. The exterior is made from stainless panels, chosen for their ability to resist the strong winds and to strong thermal excursions. Above the panels have been installed some photovoltaic and solar panels that produce 20% of the electricity needs and 80% of the thermal energy. In addition, a combined system allows the building to recover 100% of the waste water. To stay here you must book. 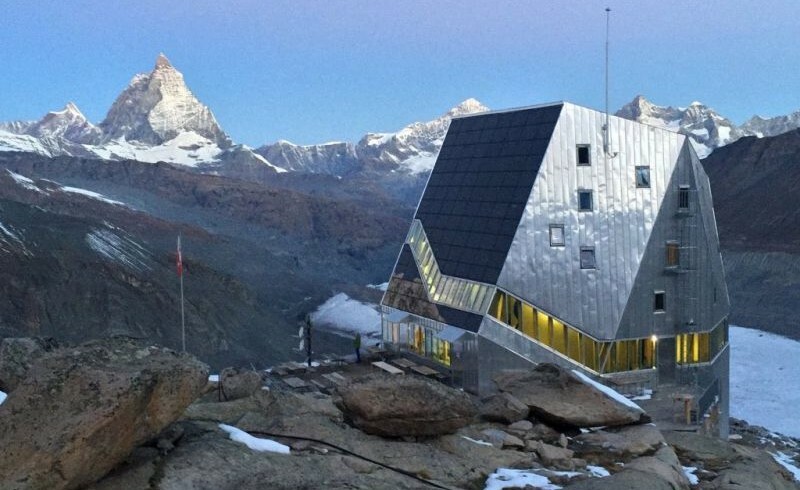 The shelter Monte Rosa Hutte is a complex and very special wood construction, that with its unique shape, and the coating of aluminum plates looks like a crystal. The facade covered with photovoltaic panels ensures a cover of 90% of the energy needs of the shelter, which also is able to store and reuse waste water through a filtering system. We are in the Val d’Aosta, we begin to walk in Lavachey to reach the Gervasutti bivouac. We are amazed by its very special form, in perfect harmony with the Mountain. Designed by LEAPFactory, internally there are 4 rooms (entrance, room for lunch, 2 dormitories with 12 beds). The building is completely self-sufficient from an energy point of view thanks to photovoltaic units of last generation and the use of hot plates for cooking. It is a common shelter, access is free for anyone venturing into the mountain; reservations are not required. Kezmarske Hut is the name of a unique shelter in the world, located on the border between Slovakia and Poland. It looks like a poised ice cube, or something from outer space. It blends perfectly with the surrounding landscape and is a haven of five completely passive plans. The exterior consists of glass, metal and photovoltaic panels that make the reflective facade, the interiors are characterized by the presence of wood. You know other eco-friendly shelters? 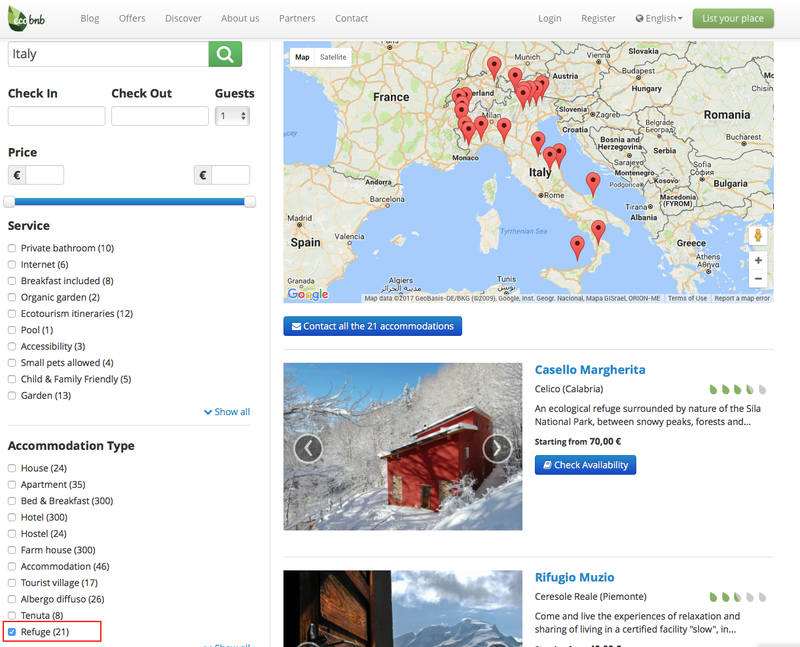 If you want to book a holiday in the mountains in other eco-friendly shelters, you can do it with Ecobnb! In our network you can find several huts, in Italy and in the world, that respect the environment. To find them simply enter the destination and select on the left “refuge” among the Accommodation Type. Hut Luca Vuerich: if you reach it, stay for free! 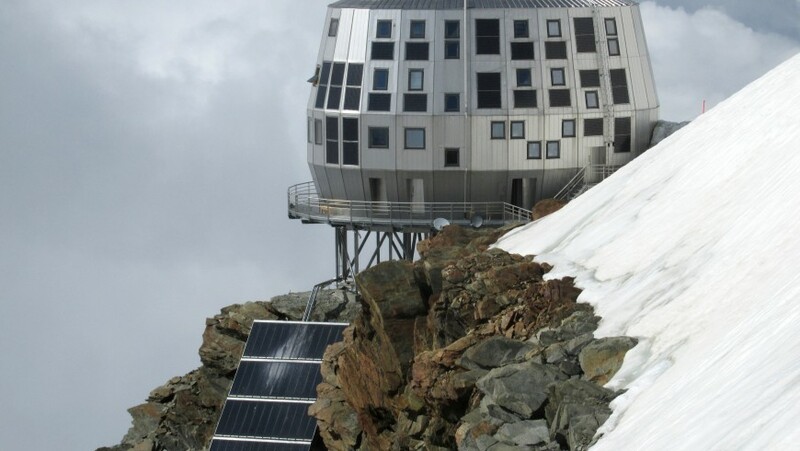 This entry was posted in green hotels and tagged Alpine Shelters, eco hotel, France, Italy, mountains, refuges, shelters, Slovakia, Slovenia, Switzerland, unusual accommodations. Bookmark the permalink.